Everybody knows that Gold is valuable. A lot of people recognize gold as a form of jewellery. However, gold can also take other forms. Gold can come in the form of bars or in the form of coins. Regardless of the country or region where you are, gold is treated as a commodity on its own. It is used as a trading tool at the international stock markets. This makes gold trading prices comparable to other good traded in the market globally. Gold trading price is measured in ounces, so a gold’s price can be measured by ounce. Gold’s price is not a set price. It fluctuates all the time depending on the market trends. Gold trading prices can be found in news channels, newspapers, and even on business and trading websites. However, you should not expect to see an exact and same price that you through these mediums when you are dealing with a seller. Gold trading prices varies depending on what form it takes. Gold jewellery and gold coins require unique production so expect that these are more expensive than standard gold bars. Antique items made of gold can also have higher prices since they have inherent antique and gold value. It is easy to find gold trading price per ounce today if you want to buy or sell some of the prized metal. But why is gold trading price and the gold itself important to investors? The answer to that is because the amount of gold globally is limited. Plus the fact that this precious metal cannot be reproduced and can only be discovered. This gives gold its stable value that is most of the time high. The gold trading price per ounce is high as I write this. This can be attributed to one simple fact. All other financial investments that you invest in are very unstable; they reduce value at any given time. The more people who seek to have possession of gold, the higher the demand. So will the price of gold increase. What are Your Options for Trading Gold? A lot of investors are looking for different options for trading gold. Here are some gold options that you can use for buying gold. 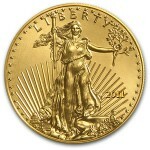 A gold coin is perhaps the most popular way to purchase gold and buyers can actually take ownership of the gold coins. Gold coins are valued according to their weight, rarity, and type. If you choose this option you need to consider the security of these items since you will have the physical gold in your possession. Gold bars are the traditional way to trade gold and can be purchased through banks, commodity brokers, and gold bullion dealers. These gold bars come in a variety of weight. 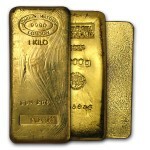 The largest gold bars are the one preferred by traders and large companies who investment in large gold quantities. Numerous options for buying gold online have appeared in recent years. For example, you can purchase gold on a regular basis depending on your budget. Opening a SilverSaver® account takes just 10 minutes. There is no paperwork to send, and as soon as your account is verified, you can schedule purchases to begin immediately. Exchange traded funds (ETF’s) were developed back in 2003 as a way of trading and investing on gold without the hassle of storing the actual physical product. Gold exchange trade funds are traded on the major stock exchanges globally and provide traders an easy way of gaining exposure to the precious metal. I don’t recommend buying ETF’s or gold certificates, but prefer holding the physical metal. Of course, you can also purchase stocks of mining companies. As the gold price raises the mining company’s profits also increase and the gains are passed on to the shareholder. Unless you are an experienced trader, I also don’t recommend this method for investing in gold since there are a lot of factors to consider when choosing a good mining company to invest in to. It is important to consult with a qualified and highly trustworthy broker to determine the best gold trade option for you. Tags: financial investments, gold bars, gold coins, gold jewellery, international stock markets, stable value. Filed under Gold Trading by Vic Bilson on Sep 19th, 2013 . Enter your information below to receive instructions for downloading your free copy of "Recession Survival: How to Profit from an Economic Recession" PLUS information about accumulating more silver for yourself.